Allessandro Dinatale, Liam Kerr and Adam Valentini celebrating the Scarborough Ice Raiders 1st Tier 1 City Championship !! Knights Midget Seniors Win Tier 1 Championship!! Justin, Victoria and Ranger friends get together during March break. Duncan Fenn enjoys the all star game!! 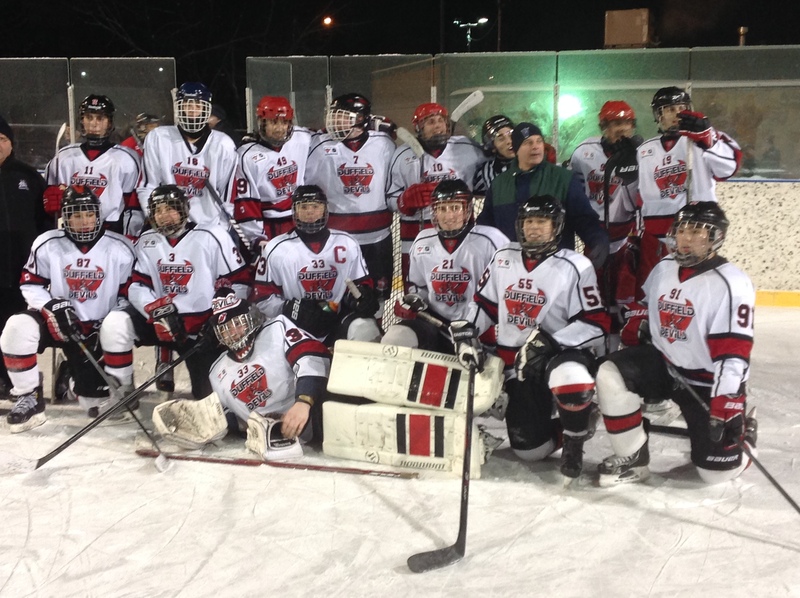 The NYHL recently completed their 1st Outdoor Winter Classic on Saturday February 21, 2015. The event was held at Glen Long arena which is located off Dufferin just south of Lawrence. This event was held for our U21 division and involved 6 of the 7 teams that are currently in our league. The representatives from our U21 committee came up with the idea in our November meeting, and the league put the plan into action. We could not have asked for better cooperation from the weather as our games were scheduled to run from 6:45-9:45. It was snowing all day and at around 6:00 the snow came to an end which allowed for enough time to get the ice and bench areas ready to use. Prior to each game all the players and coaches received a winter toque supplied by the league as well as a voucher for a hamburger or hot dog combo supplied by “Fire it Up” BBQ company which the league supplied as well. In addition, all the spectators received a coupon for a coffee or hot chocolate for braving the cold and cheering on their team. All the games went off without a hitch, and all the participants seemed to have a great experience with the whole event. City TV was also able to come out and film some of the action along with conducting some interviews of the players for their 11:00 news that night. Overall it was a unique event that added to the entire U21 program. It displayed the benefits of having an U21 committee and it was a great stepping stone in building the relationship between the U21 division and the NYHL. Vaughan Rangers Minor Novice White are Victorious at the Shamrock! Nolan and Jimmy from West Hill are enjoying their time on the pond! The NYHL would like to congratulate Doug Carman on winning our weekly giveaway prize. Doug received a $50 gift card to the Goose and Firken which is located on Leslie just south of the 401. The NYHL hopes Doug enjoys his night out. Make sure you check your tickets regularly. Prizes must be claimed within two weeks of the number being posted. To make it easier, the color of the ticket is also included along with the number posted on the NYHL website. This year the NYHL will once again be having weekly rewards taking place. The winning tickets will be posted on the NYHL website each Monday and will be up for a two week time period. We have been lucky enough to get some great supporters who have generously donated some great prizes for our league. The prizes range from restaurant gift cards to passes for activities the whole family can enjoy. We ask you to be sure to check out our supporters on the website for more details on what they have to offer. This can be done by simply clicking on a specific logo, and you will be directed to a link for that specific sponsor. As team staff, we kindly ask that you please inform all your players, parents and friends to keep their ticket stub they receive upon entering the arena each night. The person with the winning tickets should contact the NYHL office by e-mail at coo@nyhl.on.ca within two weeks of the number being posted on the website to eligibly claim their prize. The Don Mills Mustangs Novice team get ready for their outdoor game. The Vaughan Rangers Minor Novice White’s Red line attacking the net. The NYHL would like to congratulate Paolo Frasca of the Vaughan Rangers Novice Red team on winning this week’s giveaway prize. Paolo won a one night hotel stay at the Country Inn and Suites in Niagara Falls, Ontario. The NYHL hopes Paolo and his family enjoy their getaway. The Vaughan Rangers Minor Novice White represented the CVHA & NYHL well by winning the SHA Valentine’s Tournament this weekend. The team was undefeated for the entire tournament with 21 GF and 1 GA winning the Championship game 4-0. Congratulations Boys!!! North Toronto Novice Green won the Bradford Bulldogs Blue & Gold Classic Tournament at Nottawasaga this past weekend. The final of three winning teams in the H2T Dryland Fitness Contest is the Victoria Village Atom Blue team. This team was randomly selected from a large number of entries. These players experienced a great time at the H2T facility. We encourage those that have yet to do so to be sure to check out their link on the NYHL website. The NYHL would like to congratulate Evy Elgersma on winning our weekly prize. Evy received a gift card to Wendel Clark’s restaurant along with a movie pass to Rainbow Cinemas. George Bell Titans Peewee Navy team went undefeated all weekend to win the Big Bear Big Chill Tournament in Ann Arbor, Michigan. The Duffield Devils Novice White team were Champions of the Burlington MD Challenge Cup and then proceeded to capture The Bradford Bulldogs Blue and Gold Tournament. The West Mall Peewee team were the lucky recipient of the Toronto Marlies giveaway contest. The team received 33 tickets to the game along with enjoying the fan tunnel experience. This was all held at the Air Canada Centre. Congratulations and we hope you had a great time! Duffield Devils Novice Silver – Bradford Bulldog Tournament Champs! Duffield Novice Silver represented the NYHL very well by capturing the Bradford Bulldogs Blue and Gold Tournament, being crowned the Novice Select Champions with a 3-0 win in the finals. Duffield Minor Novice team enjoys a great day at H2T ! H2T Dryland Contest – Team had a great time and the trainers were very good with the team. Avenue Road Bantams win in Vermont! Duffield Novice Silver getting ready to go on the ice and stand beside the Marlies players for the playing of our National Anthem. Vaughan Novice Black Win in London!! The Vaughan Rangers Novice Black (06) team won the Bronze Division Championship in the 2015 West London Byron Optimist Competitive Tournament this past weekend. They were un-defeated the entire tournament. They won our 3 qualifying round games, won the Semi-Finals in Shootouts​and won the Finals in O/T. A big THANK YOU to McKenney Custom Sports, Majer Hockey and the NYHL for being so generous! The NYHL would like to congratulate the Hillcrest Summits Bantam team as they are the lucky recipient of the team pant contest. There were numerous entries and this team was randomly chosen as the winner. The team will be properly fitted and our goal is for them to have their new pants in time for our winter season. A big THANK YOU to McKenney Custom Sports, Majer Hockey and the NYHL for being so generous! From November 27 until November 30th, the NYHL ran its first ever Referee Exchange Program with an official from the Ottawa District. The NYHL selected Troy Whetstone and Will Dykeman from a list of deserving officials to represent the league in this endeavor. Derek Sleigh was the official from Ottawa. While in Toronto, Derek was able to officiate 15 NYHL games along with seeing the sites our city has to offer. The group of officials had lunch at Wendel Clark’s restaurant, visited the Hockey Hall of Fame, but the highlight of the trip was to attend the Toronto Maple Leafs vs. Washington Capitals game. It was a great game and the Leafs prevailed, but the real thrill for this group was the opportunity to visit the NHL officials room before the game and chat with the referees working the game that night. The NHL officials were extremely welcoming, talking about the lifestyle of an NHL official and answering any questions that they were asked. The NYHL would like to say “thanks” to Francois Charron, Brian Pochmara, Steve Miller and Greg Devorski for allowing these aspiring officials the opportunity of a lifetime. We would also like to extend a very sincere “thank you ” to NHL official Greg Kimmerly who graciously arranged for this unique experience. Both Will and Troy will be representing the NYHL skating games in the Ottawa program and exploring our capital city at the end of January. How Was Your Tournament Experience? Have you recently participated in a Tournament? People are always looking for feedback on how tournaments fared. One of the NYHL unique new features is located in our tournament section of our website. We are asking participants to take a few moments to complete a quick survey to help others know how each tournament fared. Please go to our tournament link and then click “submit a survey.” Once multiple results are in, they will be tabulated to get overall results. The North York Hockey League and Scotiabank are proud to announce the first annual coaches workshop. This opportunity will be open to the first 200 coaches that apply on a first come basis. Both Scott Morrison and Neil Smith are well respected personalities in the hockey community, and have graciously offered to conduct this workshop for us. They will be discussing numerous topics, including how to keep the game “fun” for the kids, as well sharing their experiences and stories. This will be a valuable opportunity to enhance your coaching knowledge and become even better role models. The date for this event will be Wednesday January 28 at 7:30. The event will be held at York University in Lecture Hall ACW 109 and is #93 on the following map. The closest parking area is # 72 York Lanes Parking Garage. The Faustina Tyke Select team getting ready for a game at Downsview. East York Novice “Blue” are champions at North Toronto Tournament. H2T Dryland Fitness Has First Winner The inaugural winner in the H2T Dryland Fitness Contest is the Duffield Devils Minor Novice Silver team. This team was randomly selected from a large number of entries. These players will now have a unique and fun opportunity to experience dryland training unlike any other. We encourage those that have yet to do so, to remember to enter for two chances to win in the near future. The Parkdale Flames Atom team had a chance to show off their skills between periods at a recent Toronto Marlies Game. Here is a picture of them in the room getting their instructions beforehand. This was a great opportunity for these young players to show off their skills in front of many observers, as well as they enjoyed the Marlies game. They all had a fantastic time. A special “thank you” goes out to the Marlies for their support and for giving these kids an opportunity of a lifetime. Pic of the week: All eyes on the puck!! Twins Gabriel and Heath Couture along with Patrik Halaj of the Parkwoods Stars Atom Selects team during the last seconds of a very exciting game against Leaside Red. The NYHL would like to congratulate our first winner of the season in our weekly giveaway draws. Brittany Kostuch received a gift certificate to the Goose and The Firkin which in conveniently located on Leslie just south of the 401. Please be sure to check out their website in our sponsors section on the NYHL website to see their great offers. Make sure you check your tickets regularly. Prizes must be claimed within two weeks of the number being posted. To make it easier, the color of the ticket is also included along with the number posted on our website. Robin Clarke from a NYHL game that took place on November 3rd, 2014. Duffield Devils Black 2006 vs. Leaside White at John Booth Arena. Vaughan Tyke Select Tier 1 Champs!! Starting from left to right of the Marcus Marchildon on the left goalie Liam Kerr gets Hardhat teammate Adam Valentini on the right. Scarborough Ice Raiders shut out the George Bell Navy 2-0 to win the Vaughan tournament.